September has seen many first days this year, some monumental and some, well, not-so-much. 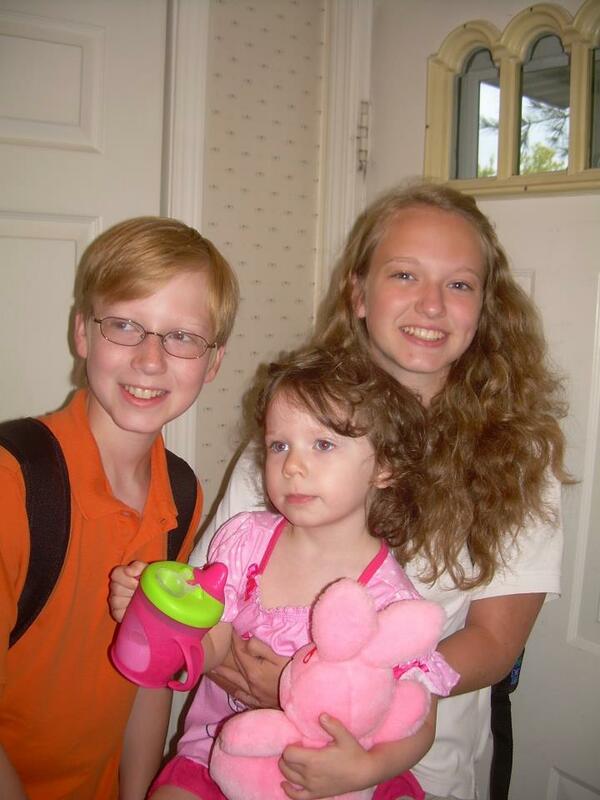 One week in particular ushered in the first full week of school for all my kiddos spanning preschool to high school. Ahh, welcome to My Mid-Life Motherhood! Our high school eased the students from summer haze to school days over the span of two weeks with half days, all school picnic, Labor Day, back to school night and a retreat! Considering my starting-school-in-August-is-akin-to-heresy-mentality, this more relaxed start to September helped ease me into the back to school mode. In fact, so much so, that I really didn't feel the full force of our fall schedule kick in til almost mid-September! Cupcake wearing same dress Darlin' did for first day of preschool! Cupcake's first solo day of nursery school was on 9/11. Exactly eleven years earlier I had been with my son at his first day of nursery school. Both gorgeous September days, with unbelievable blue skies and each with different memories for me. His, I will never forget because after his school orientation we climbed in the car to see more than a dozen missed calls from Hubby, concerned of our whereabouts having heard of the attacks. The remainder of that day was spent watching the events of September 11, 2001 unfold before our eyes, etched forever on the hearts of Americans. Hers, more than a decade later, I spent with my littlest one relishing the time with her as I do each of her milestones, since each one marks the end of an era for me: infancy, toddler time, and now pre-school! Cupcake enjoys going to school and playing with her new friends ("fans" as she calls them!) The first day she told me that she cried because she missed me and that a boy got time out. I inquired of the teacher to find out that neither episode had occurred. We had a good laugh over her creative imagination (aka, lying!) The teacher indicated that she plays well with others and enjoys telling all kinds of stories (translation: she talks a lot!) She has already come face to face with the green eyed monster, when she came home from preschool talking non-stop about another little girl's back pack with two princesses on it. Cupcake promptly found her princess back pack, proceeded to throw it and scream about how she wanted the back pack with two princesses on it and hers only had one...mind you she had brought her Minnie Mouse back pack to school. As she was throwing her back pack fit, I asked, "What's your problem?!" to which Darlin' retorted, "Envy, Mom. It's envy!" Welcome to preschool. Traditional first day of school picture! Bud began his high school career as well as he completed his junior high days...with a bang! He's been enjoying his freshmen year immensely. So far he has landed parts in two plays (school and community theatre,) and been elected President of the freshman class. In addition, he hopes to do basketball, join the debate club, try tennis and make the county band. He's full of ideas, eager to get involved and I look forward to seeing all he hopes to accomplish this coming year! Darlin' started out her Junior year driving everyone to school, under the watchful eye of her drivin' instructor, Dad. I watched prayerfully as she backed very slowly down the drive way and drove out of our development. Then I waited anxiously til I could call Hubby to confirm the safe arrival of all our precious cargo at school! After the first half day of school, I thought we would be in for a tough tear-filled year with Darlin'. She came home that day so overwhelmed at the prospect of taking three Advanced Placement classes and I wondered if it had been the right decision. Since then, she has masterfully accomplished all her work, managing her time quite well and doing so without the tear-filled panic I had imagined. Each and every milestone my kids hit is what make My Mid-Life Motherhood memories something to cherish. They certainly keep me entertained from princess back pack to drivers permit and everything in between...it's sure to be a memorable school year!